At Mercari, we hire both new graduates and mid-career talent on a rolling basis throughout the year. As a result, we’ve managed to gather together members with a variety of different backgrounds, including many with experience studying/working overseas. So, how are our members with such overseas experience utilizing their skills here today at Mercari? 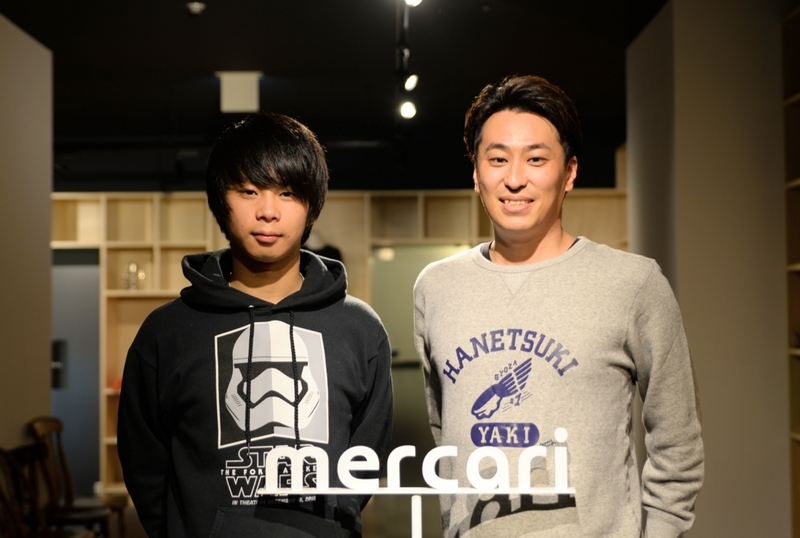 In this edition of Mercan, we’ll be speaking with Shinya Kataoka (@shinya) and Masanori Uehara (@jackchuka), two members of the Mercari US Team who graduated from university abroad. We’ll hear about their experiences in the US and why they made the decision to come back and work in Japan. Product manager for the Mercari US Team. After graduating from Ohio State University in America, he began his career working as a consultant. He joined Mercari in July 2014 after returning to Japan and spending time at Askul, GREE, and FreakOut Holdings. Server-side engineer in the Mercari US Team. He joined Mercari as a new graduate in April 2017 after graduating from the University of California, Irvine. 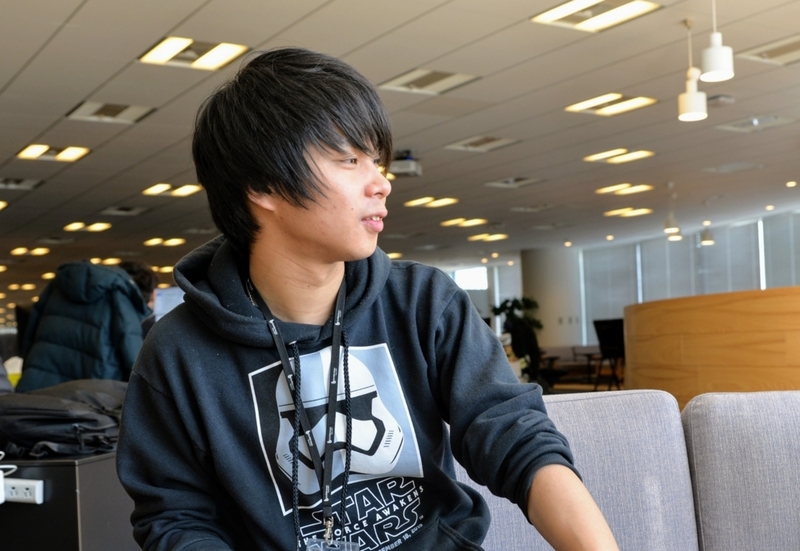 He started out working on the JP Team, but recently moved to the US Team here in the Tokyo Office. @shinya：When I was in the US, I studied supply chain management–a pretty broad major that examines the whole process from when a new product/service is created, all the way down to its delivery to the customer, basically looking for ways to optimize or improve the overall process. But you studied computer science, right @jackchuka? @jackchuka：Yeah, I mainly studied software and algorithms–it was pretty close to the information engineering programs you see at Japanese universities. @shinya：Our majors were different and there’s a bit of an age gap between us, but we both joined Japanese venture companies right after graduating university abroad. I’m sure you also had the opportunity to find a job somewhere outside of Japan, so why did you choose to work at a Japanese venture company, and why Mercari? @jackchuka：Well, I’m an engineer, so I was looking for a company that was strong on the technical side. I was following a number of different Japanese IT companies’ tech blogs back then, and I came across a lot of blogs written by Mercari engineers. Then I had the chance to meet some Mercari members at a career forum, and this solidified my decision to join as a new grad. @shinya, you worked at a few major venture companies before Mercari, right? Where did your initial interest in Japanese ventures come from? @shinya：I think @jackchuka probably had a similar experience, but going overseas by myself helped me realize that my identity is pretty strongly rooted in Japan. @jackchuka：I think it’s pretty common for Japanese students who attend university abroad or go on exchange to come back appreciating Japan more than they did when they left. I can’t tell you how ready I was to return to Japan at the end of my university years, but it’s not cause I was homesick or anything. I think I had started to see the different ways I could use my skills back in Japan. @shinya：When living overseas, you obviously come into contact with the local culture and customs, but in my experience, the Japanese parts of myself also came into pretty clear focus. I lived in America for four years, and that experience made me recognize how much I loved the country I was born and raised in. More than that, it made me want to share my love for Japan with people abroad who weren’t familiar with it. This kind of thinking led me to search for Japanese companies aiming to succeed on a global scale and ultimately brought me back home. @jackchuka：Why did you choose to work at a venture company? @shinya：I felt that a venture company would allow me more freedom and opportunity to take on responsibility from the get-go. I graduated university at 26, and so I always felt like I was falling behind other people my age. I wanted to get a lot of experience, take on responsibility, and grow as fast as possible, and that’s why I chose to work at a venture. @jackchuka：@shinya, you joined Mercari back in 2014, right? How have things changed since then? @shinya：Well, to put it simply... our CEO Shintaro was still writing specs himself back then! At the same time, we had already established our US office and were right on the brink of rolling out our service there. We were obviously interacting with people in the US on a regular basis, but development was still being carried out entirely on the Japanese side. Contrast that with the current situation, where we have many local engineers working out of the US office who are able to move on their own without instructions from product managers. We are still doing some development for the US product on the Japanese side, but our developing speed has shot up dramatically since we started employing engineers locally in the US. @jackchuka：I joined as a new graduate in April 2017, so I haven’t experienced quite that big of a change yet, but one thing that left an impression on me recently was when the US Team suddenly announced on Slack that, moving forward, we would be communicating primarily in English. From that moment on everyone started using English-I really thought that was amazing. I’ve also had a lot of opportunities to communicate with foreign engineers in English as of late. Mercari is actively hiring not just in the US, but also in India, Asia, etc. If things keep moving forward like this, I think it’s safe to say the company culture will change a lot in the year to come. @shinya：In terms of changes on a global level, I personally feel that the consciousness of US Team members towards the importance of succeeding in the US has really changed over these past 6 months. In my opinion, one of the main reasons behind this is John Lagerling joining us as US CEO. Since then, we’ve been able to attract many experienced, influential members in the US and are creating the foundations for an even higher-level organization. I really believe that we’ll succeed in the US if we keep working hard with our current team, and this conviction is shared not just by older employees like me, but by a lot of our new hires as well. I think this is thanks to the fact that my team gets to travel to the US regularly, allowing us to experience the atmosphere and work of the US office first hand. @shinya：How long were you in the US, @jackchuka? @shinya：Wow, that long? That’s why your English is so good! @jackchuka obviously has great technical skills, but his language ability is also really impressive. So when there’s a job that requires interacting with overseas partners or working with members who don’t speak Japanese, he’s the one I assign. There are some phrases that might rub people the wrong way in Japanese, but don’t have any similar effect in English. @jackchuka can doesn’t just speak both English and Japanese, he also knows both cultures as well, so he’s able to communicate very effectively. @jackchuka：From my perspective, @shinya is always working hard to ensure that our team runs smoothly. He goes to great lengths considering what is best for each member and tries his best to learn about each individual’s preferences and goals. Because of this, any new members that join our team are able to quickly integrate and start working to the best of their ability. @shinya：At Mercari, we don’t just have a lot of members who went to university abroad, we also have a lot of members with experience running their own businesses overseas. Because of this, there are a lot of English-speakers, and everyone is really open to and accepting of different cultures. Unlike most Japanese companies, the nail that sticks out isn’t hammered down–we value the individuality and personal strengths of each person. @jackchuka：When I first went to the US, I still had a pretty Japanese mindset, and so I found it difficult to look people directly in the eye or to spontaneuosly strike up a conversation. But I tried impersonating other people around me who seemed to be having fun while talking, and it actually went smoother than I expected. Each country has its own unique culture, and communication is always smoother when you take these cultural differences into account. I think experiencing both Japanese and American culture has given me a better ability to adapt and adjust to different situations, and it’s much easier to communicate when you have this skill. @shinya：I think that anyone who’s attended university or school outside their home country has had this experience of “unlearning” at least once. When going overseas, you come into contact with an unfamiliar culture, meet new people, and have a wealth of experiences that you never would in your life back home. Through this, you’re forced to challenge your preconceptions and adapt to this different culture you’re presented with. It might go without saying, but in order to accept a new way of thinking, it’s necessary to change yourself as well, and those people who manage to live abroad for extended periods of time have all, without exception, been faced with this challenge of unlearning what they know and changing their way of thinking. I think you could also phrase it in terms of Darwin’s survival of the fittest–only those who adapt and change are able to survive. Generally speaking, those individuals with experience living abroad are capable of making the changes/adaptations necessary to survive, so I feel that young people with this sort of experience are already equipped to adjust to a new company before even joining. @jackchuka：I think my experience reflects what @shinya was saying pretty well. When I joined Mercari, I was initially assigned to the JP Team, but just three months later I changed to the US Team. Looking back, I think this sudden change required me to adapt and change quite a bit as a person. @shinya：When you move teams, your everyday work obviously changes, but so does your manager. I’m a little different from other PMs in the sense that I ask my members to take on responsibility beyond just engineering. My goal is to push them a bit beyond their comfort zone in order to help them to grow. @jackchuka：People who enjoy these sorts of dramatic changes will fit in right away at Mercari. @shinya：I agree–I think it comes down to whether or not you have the ability to adapt and adjust to that change. Mercari’s mission is to create value in a global marketplace where anyone can buy and sell. Our service has already become a part of many of our user’s daily lives, and if this trend continues for another couple decades it will become something close to a culture. In my opinion, working on a service like this is a once in a lifetime opportunity. Some people might find the pace of change at Mercari to be a bit drastic, but, I think that this change requires you to be constantly adapting and makes Mercari a great environment to grow in. In a sense, joining Mercari is like going to a new country by yourself. You need to be able to change your mindset to adapt to a constantly changing environment. As for all the challengers out there who feel up to the task, we’re waiting for you. ※Mercari will be attending the San Francisco Career Forum on the 17th and 18th of February 2018! Please attend if you’re in the area!